Hot, funny with plenty of swoon worthy moments. Leaves you thinking that there is no way that this is her debut novel. I NEED more Cane and Jade. I’m looking forward to the next books by Adriana. Jada Stanley, newly single, after getting out of an abusive marriage. Moves back home to be near family and start over. She wants a fresh start, but in order to do that she needs to avoid the bad boys, the players that she is usually drawn to. Cane Alexander, the definition of player. I think his picture is next to the definition. He likes his revolving bed of woman. Until Jada enters his life, all he wants is one night with her. But will one night be enough. This story is full of highs and lows, twists and turns that you never see coming, moments that take your breath away sometimes in a good way, sometimes not. The story captivates and keeps you turning pages no matter that you have to do. Once you pick it up there is no way to put it down, no good spot that won’t leave you wondering what’s next. 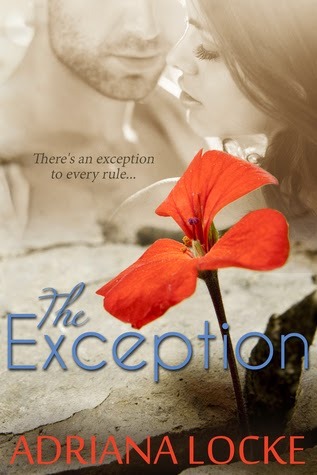 If you are looking for a good book, with humor and hot steamy guys, pick up The Exception!